Please select an option 6 inch 8 inch 9 inch 10 inch Please select a Size. 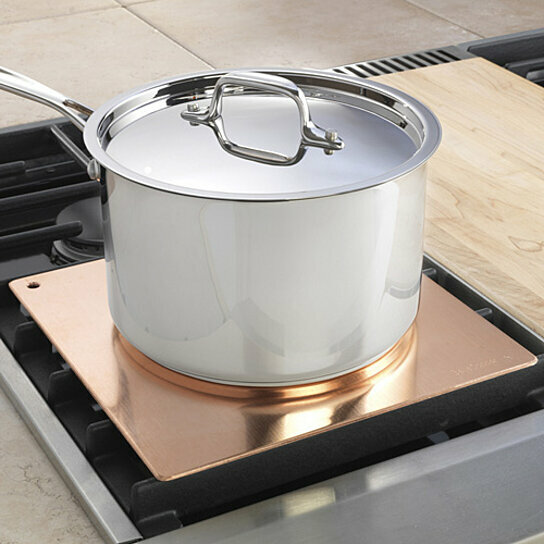 The BellaCopper heat diffuser can give all of your steel, iron and aluminum flat bottom cookware the virtual performance of copper cookware at a fraction of the price of copper cookware. An essential kitchen tool. An excellent Heat Diffuser, Simmer Plate, Heat Equalizer, Stove Multiplier, and a truly fine Defroster Plate - just put the frozen food on a room temperature BellaCopper defroster plate and it defrosts like magic! Two frozen chicken breasts will be ready to cook in 30 - 40 minutes. BellaCopper heat diffuser leverage the thermal conductivity properties of copper. Copper is 70% better in heat transfer than aluminum, 5 times better than iron, and 23 times better than stainless steel. These plates are made from C11000-High Conductivity Copper, 99.9% pure. This grade of Copper was developed for high conductivity, both electrical and thermal. Can be used on all gas and electric ranges as well as ceramic & glass stove tops.